Two month old baby Ruth was abandoned ________, but the Police have found the mother and once a family member has been found the babies are no longer adoptable. Little Ruth is a beautiful baby but has some scars on her knuckles and wrist. 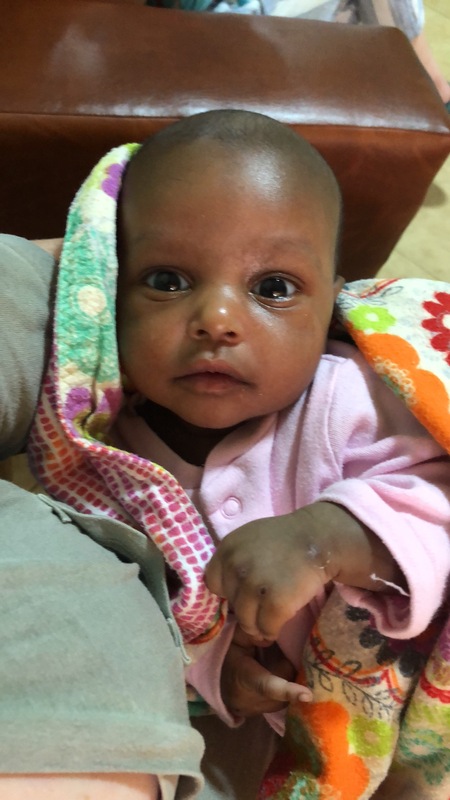 When the baby was brought to Neema Village the mother was allowed to come see the baby. She seemed uninterested and left without saying goodbye or kissing the baby. This is an unusual story since most of the women who abandon their children only do so as a last resort and are quite upset at having to make such an awful choice. We never know what brings a woman to this point but it is not our place to judge. We are too busy loving and caring for these little ones God has placed in our care to judge these women. It is important to remember that babies and children are left abandoned or uncared for all over the world, not just Africa. But the lack of governmental facilities and programs here to care for them leaves the non profit organizations like ours to beg for your help in caring for them. Little Ruth will need your help. Please click on the donate button and set up a monthly sponsorship for her. We cannot do this work without individuals who care about the world’s poorest and unwanted stepping in to help. Sponsorships start at $30 per month but it cost $300 a month to keep a baby at Neema Village. Any amount you set up will help. Bless you.